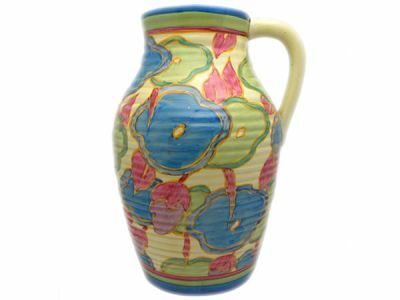 A single handed Lotus jug from c. 1931, hand painted with styled flowers and blue and green banding. Excellent condition. Bottom stamped “Fantasque hand painted Bizarre by Clarice Cliff Newport Pottery England.” The jug stands 29.5cm high.